This blog deals with grid-based puzzles and the various types of logic and ideas used to solve them. It also contains notices, information and results about various puzzle and sudoku championships across the globe. I will keep this blog open as an archive. I thank all readers and friends for making this blog a success (according to me!). After a long break, I'll be back blogging, but not here. Come visit my new blog. The World Puzzle Federation is organizing its first online sudoku event. It consists of eight contests organized by WPF members from eight countries. On a personal note, many of you would've noticed my sudden absence and minimal participation in recent championships. I am taking a break from solving puzzles/sudoku. I will continue creating and authoring puzzles but I will participate only in the WPF GP 2013, the Indian National Championships and World Championships 2013. Hoping to get back full-fledged by early 2014. The 7th World Sudoku Championship was held from 1st-3rd October, 2012 at Kraljevica, Croatia. The Indian team was selected from the Indian Sudoku Championship 2012 and I had hinted this team is probably the best four in India presently (considering Rishi is not in India). The first thought on seeing the IB was "This is going to be exhausting". 7 Individual Rounds + 2 Team Rounds in a day is a bit too much in my opinion. Regarding the rounds and the puzzles, 5 of the 7 rounds were based on some linking between the puzzles. Most of the sudokus were well-known types or minor tweaks to common variations, so not much of 'new variations' to look forward to. I finished 12th at last year's World Sudoku Championship missing the playoffs by 2 ranks. This year, only the top 8 qualify for playoffs and that was my goal. Another surprise was defending champion Thomas Snyder's decision to not participate in the WSC as his focus and goal was to win the WPC and thus be the first player to win the WSC as well as WPC. It was a decent start. I could solve all but one sudoku though I had 5+ mins for the last one. This was the big round. Maximum points. Triplets of sudokus linked with a pair of common cells. It was quite messy trying to look at three grids simultaneously considering the sudokus were not on the same page. A lot of turning of pages was required. It got quite irritating after a while, but it turned out to be a good round for me. I would have preferred to have smaller sized grids, but each triplet on one page. Another linked round which was not very good. 7 mini sudokus and 1 big tough sudoku. The last sudoku was worth 30 points which is quite big considering the rest and most of the scores read 60 or 90+ thus giving a large point advantage to those 4~5 players who were able to solve the big one. I went for the kill attempting the 30-pointer as soon as I figured the missing clues, but fell short on time. That also lead one of my minis to remain incomplete. Again, flipping of pages to identify the codes of the cartoons, and then solving the Irregular Sudokus. I thought this was a bad-themed round. There was hardly any 'solving' required to figure out the codes, it was more like just flipping through all the grids and eliminating the possibilities using standard row/column/region constraints. An average round for me. This was a good round for me even though I missed the high-pointers. I've always had one bad round at every WSC and this time it was Round 6. I kept making solving errors in one puzzle after another and this round pulled me down to 11th place. Even though the scores weren't out (I didn't know I was 11th before this round), I had a feeling my rank was somewhere between 8th and 15th. It was a tough chance to make it to playoffs but possible if I had an extremely good round and some of the other competitors miss out. And it turned out to be a dream round. I finished 5th (But got time bonus of 4th place because one of the top four would've turned in incorrect solutions, I think it was Jan) and all the other results went my way. So, I finished 8th. I made it to the playoffs. The first Indian to rank in the top 10 and the first Indian to make it to a WSC playoffs (I don't consider 2009 WSC as a valid 'playoff'). It felt great, and I was extremely happy. Mine was the first playoff. An Irregular Sudoku which Kota beat me easily followed by a Medium Classic which he beat me again. 2-0 to Kota and he qualified for the semi-final. Hideaki won the first, Jakub won the second and Hideaki convincingly won the third and advanced to the semi-final against Kota. Tiit won 2-1 but it was a close fight. Jan won easily 2-0 to setup the semi-final against Tiit. An all-Japan semis which Kota sweeped. Tiit made some silly errors and Jan outclassed him. A best-of-5 finals which Jan won 3-1. It was nice meeting up with everyone again and it was a dream-come-true to make it to the playoffs. The team also performed well to get 7th which equalled our 2008's 7th rank. The sudokus were tough, which is very evident from the scores. They were fun but could have been better at a couple of places. I am not completely in favour of the playoff format used. I would never suggest a one-on-one system when the entire time you are playing against all participants simultaneously. Solving on a board is never the same as solving on paper. It may be nice for the audience but is it really the best way for solvers? Why not have the same grids on paper and use a camera, like in WSC 2010. Most of the top solvers use a lot of pencilmarks (and guesswork at times) which is not feasible on huge flex sheets. The concept of an eraser is lost. Congrats to Jan Mrozowski who wins his third WSC title to equal Thomas's record. Good performance by Kota Morinishi and Hideaki Jo and the Japanese team for an amazing result. Apart from a couple of problems, the organisers were helpful and did a good job. The results and checking was done at a fairly good pace and updates were regular. Thanks to all the Croatian organisers and hope to see more of you in future (but without cartoons please!). As for the Indian results, Gaurav and Sumit were way below par and it was disappointing to see them perform poorly. But debutant Rakesh Rai had a phenomenal result ranked 37th. Hope to see him improve in future. I really missed Rishi (I hope you read this!) this year and I hope my dream of playing with him as part of Team India comes true sooner rather than later. The Indian Sudoku Championship 2012, organised by Logic Masters India (LMI), in association with Times Of India, was held in July, 2012. Participation is free of cost and everyone is invited to participate in the event irrespective of age. There are no prerequisites/requirements for participation. Top competitors will represent India at the World Sudoku Championship 2012 which will be held in Croatia in October, 2012. There were regional rounds in four different cities and the top four contestants from each city qualify for the national finals. Good to see 1000+ participants. Congrats to the top 4 who qualify for the national finals. Jaipal and Asha are my WSC 2010 team-mates, Rakesh is an IPC 2012 finalist and Rajesh, one of the most experienced Indian at the World Championships. Again good to have 1000+ participants. Sumit is my WSC 2011 team-mate. Nice to see Raman back. Its also good to see 2 females among the top 4. Good to have 1000+ participants. Ritesh, a three-time national champion, is my WSC 2009 and WSC 2010 team-mate. Nice to see Himani back after a break. Akash is an ISC 2011 finalist. Good to have another new face, Saroj Kumar Sahu. This was leading to be the toughest of the four rounds. And without doubt, it was. 1000+ participants again, but many good players and previous finalists present. Congrats to Gaurav, Omkar and Himanshu. Due to the big pool of possible players who could make it to the top 4, it was important to do well in both the rounds. I finished the Classic round in 16mins, but after Gaurav, who finished in 14mins. I had to beat Gaurav by at least 2mins in the Variants round. I finished the Variants in 9mins whereas Gaurav took 18mins. Gaurav and me had a good lead over the rest. Good performance by Omkar and Himanshu to make it. Manoj Arora, who stood 5th with an impressive result, missed the top 4 due to a silly mistake. Tejal Phatak, who stood 7th, being the best female performer, also missed the top 4 due to swapping of two digits. Competition was tough, and one way or another, there had to be good players who would not qualify. The top 16 who qualified for the national finals, battled it out for a place in the top 4. Unlike last year where many good players could not make it to the finals, this was one that was looking to be a tough competition. Unfortunately, I made a grave mistake in one of the sudokus, and lost 30 (+60 bonus) points, a total of 90 points. Gaurav scored 280, Ritesh 250 and I, 220. 8 Sudokus of varying difficulty, 40 minutes. I finished first again with 12 minutes on the clock. Gaurav and Sumit were close behind with 11 minutes. This was the make-or-break round for most players. 8 variants, 60 minutes, and 650 points. The biggest round. I was certainly disappointed in not being able to finish all sudokus with ample time in hand. I managed to shade the odd-even cells in Parity, but I kept going wrong while solving it. Well, ironically, everyone had a bad round. Gaurav could have taken a lead but made an error in Outside, thus, pulling him down further. The rules of this round was given right before the round began. Beautiful sudoku. Perfectly executed, and exceptional feedback from all players. It was just the perfect round to end the championship. 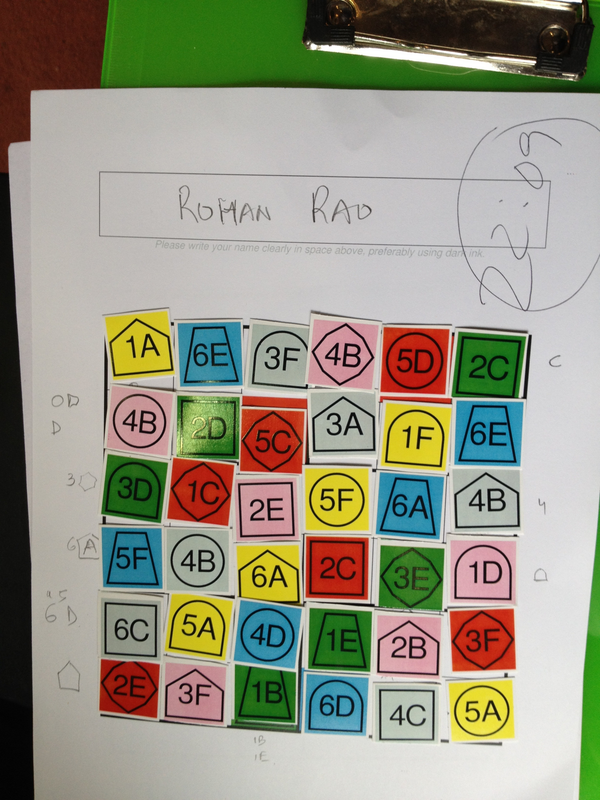 4D Sudoku: Place the 36 cells in the grid such that every row/column and 2x3 box contains each number, each alphabet, each colour and each shape exactly once. A mechanical round which was certainly well planned and implemented. 13 of the 15 finalists managed to finish it within time, with Sumit being the fastest, 30 seconds before me. I won my 3rd ISC title on a trot (equaled Ritesh's hat-trick of 2007-2008-2009). I also won my 3rd IPC-ISC double. I'm happy to have won my 6th title in a row, and hope to do well at the World Sudoku Championship 2012, Croatia. Thanks to Times Of India and Logic Masters India for organising this championship on such a huge scale. Great sudokus as usual by Amit and Deb. Personally, this was the team I had predicted when ISC started, so I'm glad it turned out to be right as I believe we have the best four sudoku solvers of the country and we hope to improve India's performance this year. NOTE: I will be regularly updating my blog about puzzles and championships, and will be actively participating in forum activities, but I'm taking a (much-needed) break from solving in a competitive mode. Logic Masters India announces the June 2012 Puzzle Test 'Seven Samurais'. It was held from 16th-18th June, 2012. The author of the puzzles is Andrey Bogdanov. 7 Standard Puzzles. All in Samurai form. I guess players need to just tweak their solving styles fractionately to tune themselves into the Samurai grid. Great puzzles. Some tough ones, but all enjoyable. I think the Yin Yang Samurai was exceptionally good, just so crisp and beautiful (if you know how to solve!). I enjoyed solving Star Battle and Easy As ABC, but the Fence was too tough. Congrats to Hideaki Jo for topping. A good weekend for him as he topped Sudokucup 8 too. The 8th Sudokucup will be held on 16th-18th June, 2012. The author of the puzzles is Vladimir Portugalov. This is a nice set of sudoku variants. Vladimir's sudokus have always been fun solving and I'm sure this one will be a complete treat. Congrats to Hideaki Jo and Kota Morinishi for completing the set. Hideaki has had a good weekend as he topped LMI's Seven Samurais too. The Indian Puzzle Championship 2012, organised by Logic Masters India (LMI), was held on 3rd June, 2012 from 14:00-16:30. It will consist of one online round of 150 minutes (2.5 hours). Participation is free of cost and everyone is invited to participate in the event irrespective of age. There are no prerequisites/requirements for participation. Top competitors will represent India at the World Puzzle Championship 2012 which will be held in Croatia in October, 2012. 30 puzzles. 150 minutes. Knowing it is a national championship, I did not expect the puzzles to be of the 'very tough' types. I was quite comfortable with all the puzzle types and the set had a good mix with a wide variety of classic puzzles as well as variants. The puzzles were fantastic. I don't expect (and neither does anyone else) anything less from Deb. Some of my favourite puzzles are: Inside Skyscrapers, Coded TomTom, Battleships 2, Coloured Star Battle, Tapa Borders and Masyu. Thumbs up to Deb and the other authors (Palmer Mebane, Serkan Yurekli and Thomas Snyder) for designing such beautiful puzzles. Thanks to Deb and team (and testers Branko Ceranic and Nikola Zivanovic) for organising a smooth and successful championship. Congrats to Prasanna, Amit and Rakesh. Commendable performance by Prasanna who has improved a lot over the last few months. Nice to see Amit back after a long time. Rakesh has always been one of the most consistent top Indian performers in puzzle championships and I'm happy with this team, probably one of the best India have had in recent years. Swaroop Guggilam was very close behind Rakesh and missed the top 4 by just 10 points. Its unfortunate to see Rajesh at a low 7th who has regularly been representing India at the WPC last 10yrs. Logic Masters India announces the May 2012 Puzzle Test 'No Numbers'. It will be held from 26th-28th May, 2012. The author of the puzzles is Ko Okamoto. Password will be available when you start the test. A lot of new puzzle types (probably all?) in this test. Many of you may not be familiar/comfortable with some of the puzzles, so below are some practise puzzles (apart from the puzzles in the IB) created by some of my puzzle friends. It is worth trying out some of these puzzles, it would only help in you being better prepared for the test. The No Numbers Loop looks like a tough one (especially considering its high points). Synchronized Maze and Trio Cut are my favourite of the set. Logic Masters India announces the April 2012 Sudoku Test 'Killing Time'. It was held from 14th-16th April, 2012. The author of the puzzles is Rishi Puri. Nice to see Rishi back. This test is based on variants of Killer Sudoku. I'm not a big fan of Killer Sudoku, but this test will surely prove to give a good insight into Killer-solving techniques. A nice, enjoyable test. Some really nice Killer sudokus. I had trouble solving the Toroidal and the Little Killer, but otherwise the solves were good. My favourite were Greater Than Killer and Twin Killer. I am 22yrs old, doing my post-graduation in Applied Statistics at IIT-Bombay. Puzzles is my passion and I won the Indian Sudoku Championship in 2010, 2011, 2012, and the Indian Puzzle Championship in 2010, 2011, 2012. I represented India at the World Championships in 2008, 2009, 2010, 2011, 2012. Chess has always been my favourite game and I achieved my FIDE Elo rating in chess in Feb-2005. I am a member of the high-IQ Mensa organisation. I love creating puzzles and have organised many puzzle and sudoku championships. All puzzles have been taken from the author/source mentioned who have the copyrights.. Simple theme. Powered by Blogger.